As some of you may or may not know depending on your Twitter following habits, for the past three months I have been living abroad in the Italian Alps studying, experiencing Italian culture and generally causing a scene throughout most of Europe. Embedded in a valley at the base of Monte del Grappa, the small town our campus calls home has truly allowed me to immerse myself in life in a different country with few distractions (read: we have one bar and one pizzeria; “few distractions” is an understatement). There’s no real way to describe how interacting with locals in another country gives you insight to what makes the world go round outside of the United States. For one thing, I’ve realized that there is pretty much no such thing as “convenience” over here. Want to go to the store between 1 p.m. 4 p.m.? Sorry, but that’s when afternoon naptime is scheduled, so you’ll have to wait for them to reopen. Counting on the bus/train/cab to arrive somewhere relatively on time? Probably going to be a 50/50 shot with that, so good luck! Over time, you grow used to these things, but not before becoming incredibly frustrated with being blocked from accomplishing the simplest tasks in an even close to reasonable way. Even though I’ve missed what you’d expect I would miss about home—parents and neighbors and friends—I’ve wound up missing the comforts of home much more. If you’ve ever lived away from your own house for along period of time, even if it doesn’t involve hotel hopping or a dorm stay, it may sound familiar to want a return to the simple things you don’t even realize you appreciate the second you get home, rather than being overwhelmed by friends and family. In my case, that means watching football at the proper time of day, being able to get food delivered at all (to say nothing of late at night), and being able to relax on my own couch and flip the TV on after a long day. Not having crazy commitments on certain days, or staying home sick and being able to throw on some classic game shows like The Price is Right at 11 a.m. Or enjoying the back-to-back game show juggernaut block of Wheel of Fortune and Jeopardy! after work. Or even, on those most rare of days, being able to half pay attention to a Lingo marathon on in the background while accomplishing something far more productive at the same time. Unbeknownst to me, for most of my time in Italy, it hasn’t been the lack of American television keeping me from watching all my favorites. It was simply the lack of a proper television itself. The only access we have to any TV is the Armed Forces Network on a single set (shout out to AFN here for keeping us connected to live sports, but still, that’s about it). This excludes not only most American programming, but also a proper look at what Italians watch while enjoying their down time. For all the overarching cultural integration we tourists get from constantly bouncing around the European Union, there are parts of life here that you don’t even realize you are overlooking until it’s called to your attention. 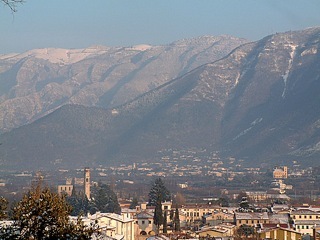 For instance, Italian television airs a variety, albeit a small variety, of game shows. You may be thinking wait a minute, this site is called This Was Television, not “Shows Currently on the Air in Another Country” and you would be correct. Game Night is, sort of, cheating a little this month. All the show’s I’m going to discussed this month are either currently airing in Italy or have only recently come off the air. But in an interesting twist, it turns out Italian game shows basically serve as a living archive for some of the most popular American shows of the past decade and a half. If imitation is the sincerest form of flattery, then the Italians like us, they really like us. None of these shows is a carbon-copy of its American inspiration, just as serialized programs adapted from another country don’t adhere exactly to their foreign counterparts. These adapted game shows fluctuate in quality (just like some foreign dramas become Homeland and some wind up as The Killing), but this often owes as much to the source material as to the producers’ execution. Much of Italy itself is represented in the differences that are so readily apparent upon first watch. Not only do the technological aspects represented in each show speak to how far behind Italy is in some major areas, but many added cultural quirks in each show offer a great look at various aspects of Italian norms. By all current indications, the head count of Italian game shows is at a very robust… seven. Yes, even though we’re used to a television landscape where Wipe Out has its own spinoff, Italy’s game show total remains in the single digits. Out of these seven shows, only one did not air at some point in the 21st century: Leave It or Double It, (essentially the Italian $64,000 Pyramid) which itself had more than a few interesting anecdotes during its four-year run. The other six shows should be more than familiar to most of you: variations on Deal or No Deal (Affari Tuoi), Don’t Forget the Lyrics (Canta e Vinci), Who Wants to Be A Millionaire (Chi Vuol Essere Millardio), America’s Got Talent (Italia’s Got Talent), Wheel of Fortune (La Ruota Della Fortuna), and Are You Smarter Than a 5th Grader? (Sei Piú Bravo di un Ragazzino di 5°). The inspiration for each of these would be almost immediately recognizable, but trying to parse out the rules without an intricate explanation might prove to be more difficult. The best example of this is Affari Tuoi, the Howie Mandel-less and big red button-less version of Deal or No Deal (itself originally developed from a Dutch format). This show was the first of the bunch I saw, on a background TV at a restaurant. My friends and I vaguely recognized it, so with no context and no sound, we attempted to interpret what was happening. After about half an hour we had had little to no luck parsing the rules and procedures, but we did spot some major differences. Trust me when I tell you that if I attempted to explain the rules properly, it would be like teaching you Klingon on your first day aboard the Enterprise. I’ve had them explained to me half a dozen times and still can’t entirely comprehend what goes on during a routine show. If you would like to take on the challenge of figuring them out, here’s a simple rundown. I can tell you however, some of the most noticeable differences between Affari and Deal and how they affect general game play. Like most international versions, the contestants don’t use a button, but the Italian version especially stresses the importance of interacting with people directly and looking them in the eye when communicating. Unlike in the US, where you can push the button as soon as the banker tells you your options, here the manager must ask you if you accept the offer after you receive it. This adds a different level of control for the host when it comes to pacing, connecting with the contestant, and the overall tone of the interaction. Also, there are six fewer cases to choose from than. Most versions offer 26, but Italy’s lowers that to 20 to represent the nation’s 20 regions. Each region has its own unique cultural cues and pride (as you might expect in a country that’s only existed as a unified political entity for about 150 years), so it makes a lot of sense that these separate areas would be portrayed prominently. Even with fewer cases, Affari is no easier to win than Deal. Unlike the straightforward “choose and open” gameplay, with each case worth a fixed amount, many more road blocks and surprises can occur. Fake prizes and mystery boxes lay in wait, sending some contestants home with a parting gift more apropos to a Saturday Night Live sketch, rewarding others with an unusually high amount. Italians love to have a good time and goof off, and its clear game shows are no exception to this state of mind. There’s also a “Crazy Box” that can double (or more) the top prize but can also torpedo the outcome of the round. 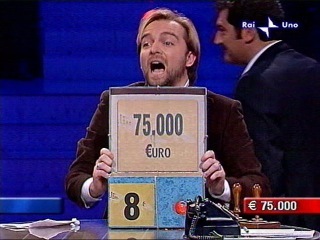 Whereas the American Deal boasted a $2 million prize during sweeps (and towards the end of its run, when it was starved for ratings), in Italy a figure that high could appear out of the blue in any episode. As complicated as the gameplay may be, the set and props are anything but. In general, Italy is a decent distance behind the US when it comes to much of the technology we take for granted. Loading a YouTube video over a wifi connection (when one is even available) is like pulling teeth only if you had to re-administer laughing gas after every one. Cell service is more or less non-existent, and attempting to locate pricing or schedule information for train tickets online is more a guessing game than a concrete plan. So it’s really no surprise that, technically speaking, Affari Tuoi could pass as a Nick at Nite game show circa 1994. As refreshing as it is to see a game show without all involved surrounded by stainless steel and back-lit furniture it’s also slightly disorienting. The “cases” are in fact cardboard boxes wrapped in string and sponge-painted, the prize denominations are printed on stock paper, and the graphics used throughout would be more welcome on a those slot machines they have at bar counters. Beyond all of that, though, comes the most amazing thing of all: the phone that the host uses to call the banker is a rotary phone. C’mon people! I thought we all agreed the only place those are allowed at this point is in hipster apartments and the Smithsonian. Overall, the set appears to be more of an arts and crafts area than a professionally produced stage—pretty representative of Italy’s overall technological condition, both mentally and physically. Some Italian game shows faced changes beyond their control. 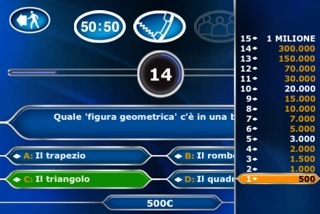 The local adaptation of Who Wants to be a Millionaire changed from Chi Vuol essere Miliardario (the last word means “billionaire”) to Milionario (“millionaire”) when Italy replaced the lira with the euro, because of the drastically different values of those currencies. But not much else is recognizably different from other editions of Millionaire: same lifelines, hosting style, logo, and set design. In the Italian version of Are You Smarter than a 5th Grader? the questions are much more difficult because, to be honest, their fifth graders are much smarter than ours. A sample question from one episode was, “Name a number less than 4,000 that is divisible by the numbers two through ten.” Yeah, go ask your 10-year-old that and see how quickly they can figure it out. One of the more interesting ways to look at the decision to produce mainly game show adaptations instead of originals is also that in most cases, the producers knew exactly how the show fared in the US and could use their knowledge of a show’s history to decide whether or not adapting would be a good idea. Despite this, they somehow decided to import Don’t Forget the Lyrics. Don’t get me wrong, Lyrics was never a complete flop and suitably accomplished its role as filler when Fox needed it to. But it was always on the outskirts of the game show popularity spreadsheet, never thoroughly disliked enough in the first season to be cancelled immediately, but also never given the prestige of airing new episodes more than once or twice a week. It had consistently entertaining elements in both the bad-karaoke format and host Wayne Brady. But still, for foreign producers to look at a middle of the road show that only aired 57 episodes and think it made the most sense to adapt over tons of other options? Curious. Even more curious when you consider that the entire three months I have been here I haven’t seen even one venue that would give Myles McNutt the opportunity to do this. For a country with so few karaoke bars, what motivation is there culturally to put a karaoke based competition on the air? Unlike the other shows mentioned above this is the only one that would lead you to believe it would not last more than a season, and this proved to be the case in Italy as well. If it were an experiment to put something against cultural type on the air instead of overwhelmingly Italian to see if something generally not found in the country would still appeal (this phenomenon should go by the “Downton Abbey Correlate” by the way), the experiment failed. Hopefully producers here learned that when you can learn from history, in this case the success or failure of a known entity in the US, you probably should. A more curious thing in the history of Italian game shows is that after their first successful game show, Lascia o Radoppa, went off the air in 1959 no game show was able to ascend to any real level of popularity until Wheel of Fortune showed up in 1989. This gap is most likely due to the insane bureaucracy that Italians deal with on a regular basis. Projects that would take less than ten years in the US are halted every time the government changes and drag on for double that time and many companies attempting to grow despite the economy are limited by arcane and nonsensical guidelines. Because Lascia o Radoppa was a state-run program, it may have left opportunities limited for a time until it was possible for private enterprises to create and air their own game shows. It is even more out of the ordinary because it went off the air shortly before Italy embraced the medium with a passion in the 1960s. This was the first decade when it was common for every Italian family to own a TV, and the country started importing American sitcoms to fill the air on its newly created second channel. Variety shows and soap operas also filled the new slots, but game shows remained rare. The programs (American and Italian alike, even including some early anime) which aired during the three decades of game show exile were more than entertaining enough to keep audiences occupied during the evenings, but thirty years is still a seriously long time to wait for a decent game show to come on the air. Especially when they experienced a show as idiosyncratic as Lascia. Despite, and in some cases because of, the state-run status of the show, it faced various incidents that would never happen in the US or in most other European countries today. This being, the Italian version of $64,000 Pyramid, pretty large amounts of prize money were usually at stake—which can get tricky when you’re dealing with taxpayer money and you don’t always want to give it to the contestant competing. One contestant, 23-year-old Maria Garoppo, scandalized the show by wearing a tight, revealing red dress on air. When producers asked her not to repeat this infraction and she was unrepentant about her wardrobe choices, they silently paid her the money she was due and removed her as a contestant, claiming she was in “doctor’s care” and could no longer compete. Now, this isn’t exactly the quiz show scandal or anything, but a government-operated entity essentially bribing contestants to leave the show because of concern over the representation of their government-operated station just seems too weird, even if it was completely acceptable at the time. Another contestant, a marginally well known Italian soccer player, was featured on dozens of magazine covers and received more marriage proposals than one person could continue to be flattered by. Therein lies the problem with being one of the most popular contestants on the only game show on the only channel in Italy. Lascia also earned some prestige thanks to being the only game in town. Apparently Pope Pius XII had enough time in the 1950s to watch the program and enjoyed it quite tremendously. He wasn’t the only high profile fan, either. Farouk I, the last king of Egypt who was exiled to Italy, was an avid viewer and actually matched the prize winnings of a young contestant after she could not continue competing for emotional reasons. It’s unfortunate that the momentum of Italian television took programs in a different direction after Lascia went off the air, but it also granted a fertile opportunity for adapted game shows in the late ‘80s to excel rather than the audience being burnt out after decades of knock-offs. Overall, Italian game shows are odd yet entertaining specimens. Combining the framework of US shows with cultural preferences has worked well for many of the shows currently on air, and there are no indications that this practice will not continue in the future. 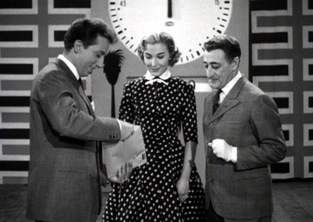 However, the popularity of the game show genre in general in Italy would benefit greatly from creating original programming to pair with existing adaptations. I just hope this advance in creativity happens before they run out of popular shows to alter.